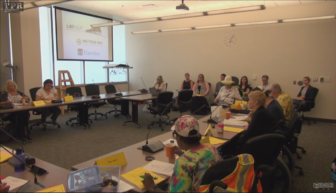 The Advisory Committee for Persons with Disabilities (ACPD) met with the Hamilton LRT project office during the regularly schedule July ACPD meeting. 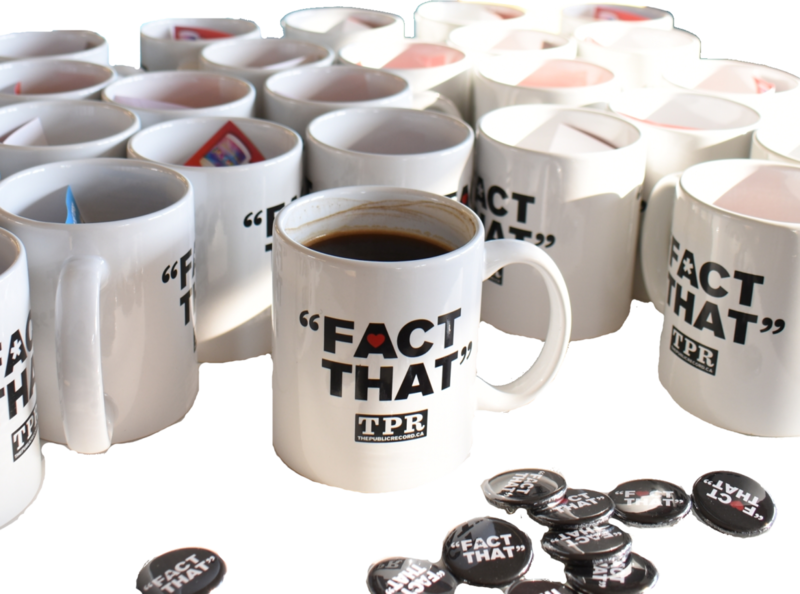 The LRT office made their standard presentation – which regular viewers of The Public Record are familiar with – to the committee and then discussion immediately began. The question and answer session which followed was noteworthy for three discussions and a theme to Metrolinx’s ‘we don’t have the answer’ responses. The two discussions of note involved how mobility devices will interact with LRT vehicles and how people will travel up to 400 metres to an LRT station on King Street with the planned end of 1-King service along the LRT route. 1) How will persons with mobility devices board the LRT? Accessibility for Persons with Disability Committee during Metrolinx LRT presentation. The answer came from the Metrolinx representatives who explained the platforms and trains will be level, allowing for a roll-on-roll-off boarding experience similar to subways and the Spadina streetcars in Toronto. The representative explained that tracks and platforms will be maintained to ensure they are level at stations. Following the meeting, I asked who will be maintaining the level standard. Specifically, I cited the City of Hamilton Public Works record of not inspecting sidewalks (costing hundreds of thousands in lawsuit settlements), and how can we be assured the inspections will be done. The answer – Metrolinx will be doing the inspections and maintaining the capital systems of the LRT. Like so many other components of the LRT, the answer that Hamilton Public Works isn’t doing the job is reassuring. 2) Will persons will mobility devices be able to actually get on the LRT or get bypassed due to capacity issues? A major problem on the HSR is bypasses of persons using wheelchairs by full buses or buses with both wheelchair spots occupied by either other Advwheelchairs or, more often, walkers and strollers. On the same day in which Toronto’s news cycle included the story of a man who waited hours being bypassed by buses and eventually put his wheelchair on the road in front of a bus to demand service from the TTC, ACPD asked how the LRT will ensure people with wheelchairs are not in a similar situation, especially closer to McMaster. The answer was not direct and took awhile to get to. The short – the LRT cars allow for passenger movement between cars so there should not be the grouping of persons that is problematic on HSR buses, and LRT has numerous more spaces for wheelchairs. There was new information in the answer – no matter if Metrolinx or the HSR operate the LRT, it will be subject to Metrolinx’s Passenger Charter. 3) Will LRT vehicles be safe for persons with disabilities. Safety on the vehicle was another discussion. Much feedback was given to Metrolinx in regards to seatbelt device for wheelchairs, and that the design must enable passengers to be able to fasten themselves, otherwise drivers will have to spend a great time of deal assisting and this will delay LRT trains. Members of ACPD outlined numerous safety concerns and problems with wheelchair restraints on HSR vehicles – especially new HSR buses where the restraint is attached to the wheelchair armrests. ACPD members are concerned the restraint could rip over the chair. One of the Metrolinx’s staffers suggested members of ACPD contact HSR Customer Service with their concerns. They caused almost the entire membership of the committee to break out in laughter, HSR Customer Service isn’t known for its customer service ability. Which brings us to the number one non-answer of the night. Numerous times during the meeting, members of ACPD asked questions about service changes to HSR and integration of HSR feeder buses into the LRT system. The answer from Metrolinx staff was they didn’t have the answer, HSR hasn’t made any concepts public, and HSR staff were not present at the meeting. What about those who presently use the 1-King and can’t walk up to 400 metres? HSR not present. Will there be stretches of the LRT route with local HSR buses that are feeder routes from elsewhere? HSR not present and doesn’t have those answers. Anderson says the HSR will be joining the LRT conversation in September and will start providing answers to questions related to the future of HSR as it relates to integration with the LRT. The HSR will have representatives at all public consultations as well. ACPD’s discussion on LRT was fruitful, their questions insightful and based in lived experiences, and Metrolinx be wise to regularly present themselves to the full ACPD for feedback during the next 18 months of finalizing plans.